The Transhuman Authority a warring empire spawned in the pitiless wastes of interstellar space, determined to rule the human race - or destroy it. Polaris a starship of the United Worlds Navy, pursued by the Authority and lost in the uncharted reaches beyond the Milky Way. Phaidros a planet that cannot exist…yet does. To find their way home again, Captain Sam Fredericks, scientist Valerie Young and the crew of Polaris must decipher its mysteries. Their discovery will forever change humanity - if they live to tell about it! 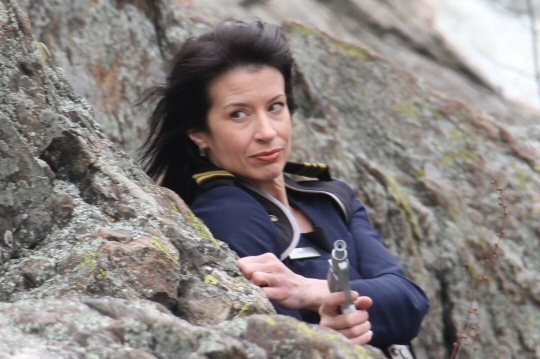 Susan Cirrincione as "Howie," getting the drop on a baddy. 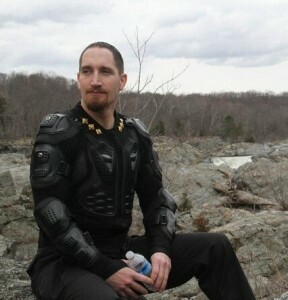 We did our first day of location shooting for Polaris on Saturday, March 5 at Great Falls, Virginia. The executive producer fretted for weeks about weather, logistics etc. Two weeks before our scheduled shoot Dennis, Director of Photography Alex Ibrahim and Associate Producer Douglas Caprette selected and scouted a site for this pivotal scene and recorded video to determine the best camera angles. Alex and his crew arrived on schedule late Saturday morning. The weather was perfect - mid 60s and overcast, giving us a nice diffuse light and minimizing the need for silks and reflectors. We would get in fast, shoot what we needed fast and get out fast. What could go wrong? Early spring flooding had turned the intended surface of our desolate alien planet into Waterworld. Within half an hour Alex and his crew - Cynthia Lin, Romel Punsel, Paula Bailey and Carl Leonard - checked out a back-up location, worked out new camera angles and were ready to set up equipment. Best crew ever. Because of the high, rocky terrain we were working in and in order to comply with park regulations we had to limit the number of cast and crew actively involved in a shot at any given time to five people. We managed that…well, more or less. Coordinated by walkie-talke, actors and crew trekked - uh, hiked - back and forth between a parking lot and the location. We were recording sound on our “desert world” right next to the flood-fed rapids of the Potomac river (“we’ll fix it in post”), a challenge that Chris Hart handled with his customary aplomb. Despite all complexities and complications we were able to set up, shoot and wrap in three hours - testimony to the focus and professionalism of our crew and of actors Susan Cirrincione (”Howard”) and Garrett L. Melich (”Gaitanis”). On Monday, March 7th we were joined by cast members Paul R. Sieber, Gina Hernandez, Frank Hernandez and John Broughton as well as additional crew Tonya Dobbs, Nick Gilbert and Morgan Bailey for another green screen shoot at R&R Lighting in Silver Spring, Maryland. Working from full storyboards prepared by our First Assistant Director Maurice Molyneaux, we shot four pages in an eight-hour day. Garrett wrapped his final work on Polaris about 3:30 PM. Garrett is a joy to work with - relaxed, funny, patient and immensely talented. We’ll miss him a lot on the remaining and hopefully final production dates in May, and I’m especially honored that he agreed to participate in Polaris. Thanks, Garrett, and I hope we can work together again. Flooding notwithstanding, our first experience on location couldn’t have been more successful or much more fun…and we’d have gotten away with it scott free, too, if it weren’t for those pesky kids and their dog! Copyright © 2008 by United Worlds Entertainment. "Starship Polaris" and related marks and logos are trademarks of United Worlds Entertainment, LLC. All Rights Reserved.